Far and away, the most popular beach destination in Tanzania is Zanzibar. Ask us about any of Tanzania's beaches and we'll organize a relaxing beach get-away for you. The Zanzibar archipelago consists of over 50 islands – which vary from tiny outcrops to the larger, more populated islands of Zanzibar (Unguja) and Pemba. The beaches are often stunning: powdery white sand, shaded by palm trees. The sea is shallow, but venture further out into the sparkling, turquoise water and you'll find coral reefs for great snorkelling and diving. The larger islands are lush and highly fertile and everywhere the air is suffused with the aroma of fruit and spices; it's an intoxicating, exotic atmosphere. Because Zanzibar has so many holiday options, we've devoted a section of our website solely to it. 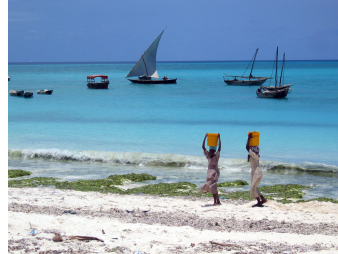 But visitors to Zanzibar's beaches are nothing new; they've been coming for over 2,000 years! The monsoon winds of the Indian Ocean enabled trade between Zanzibar, Arabia, Persia, mainland Africa and India, leaving the archipelago with a long history and a rich cultural mix. The heart of Zanzibar, Stone Town, was constructed during the 19th century: a labyrinth of narrow alleys complete with palaces, mosques, and tiny shops. It's noisy, busy and not very clean – but it has a vibrant, exotic atmosphere that can be enticing! Stay here for a night or two – it's often convenient for international flights – at one of the beautiful converted merchant's houses, and look forward to eating out. Two or three hours drive from Stone Town, the village of Nungwi marks the northern-most tip of Zanzibar. The turquoise-blue ocean surrounds it on three sides; Nungwi has long been a magnet for visitors seeking paradise. Come for some good diving and beaches, and proximity to a lively village where there's always a lot going on. The northern part of east coast Zanzibar is lined with long, powder-white beaches. We've included the pick of the small resorts here; all quite different – although their beaches are similar! Offshore you're find the magical Mnemba Island – the ultimate island lodge for those who can afford it! South along the east coast of Zanzibar and the beach remains stunning: powder-white sand with a barrier reef, lots of palm trees and a significant tidal range. The villages become a little sleepier and more relaxed as you head south, and Jambiani, in particular, is very relaxed indeed. For an authentic visit to a friendly village, you can't beat it. Fumba Peninsula is south of Stone Town. Like the southeast of Zanzibar, this is a very relaxed and friendly corner of the island which has seen few visitors. There are two good lodges here –– whilst offshore is the award-winning eco-resort on Chumbe Island. Pemba is a 30-minute flight northeast of Zanzibar. Though comparable in size, its economy is largely rural and agricultural. It's almost exclusively Muslim, with a people who are more traditional in their occupations, and more conservative in their approach. Although not part of the Zanzibar Archipelago, the neighbouring Mafia Archipelago is a group of equally magical Indian Ocean islands, just south of Zanzibar – which has just a handful of small lodges. These are more remote, and quieter, than many places on Zanzibar – and the diving and snorkelling are generally better here.